I’m excited because Springtime is here, my favorite time of the year. The air is cool and crisp, fields of flowers are in bloom, bare brown branches transform themselves into full, lush trees again, a time when nature reawakens from winter. It’s also a time when rain is plentiful, nourishing the earth with much needed moisture. Last spring I was feeling restless after a few days of constant rain and decided to take a much needed walk in spite of the downpour. I put on my raincoat, boots and took an umbrella while grumbling about the wet weather. About 15 minutes into my walk a little bit of sun broke through the clouds, placing a spotlight on a pine tree I often pass without much notice. However on this day I saw the pine tree as I have never seen it before. I stood in awe for some minutes then ran home to grab my camera to photograph one of nature’s beautiful moments. After taking a dozen or so shots I hurried home again to download the images to my computer hoping the camera lens captured the amazing sight. What I saw was much, much more than I expected. 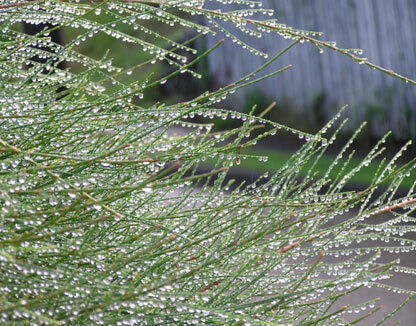 Thousands of water droplets hung off slender needles almost defying gravity. Every droplet was a perfect sphere of H2O glistening in the rays of sunlight. It was nature’s version of “bling”, a masterpiece, unique and extraordinary. Since then I look at rain differently and don’t mind heading outside with rain gear on and my camera of course to explore, to discover what nature is waiting to show me, and gently nudge me towards joyfulness. Now it’s your turn to play in the rain ! !